If you’re a fan of the major American sports (baseball, basketball, American football and hockey), traveling overseas will wake you up to a hard reality – with very few exceptions, our sports are irrelevant in the rest of the world. No one cares. Outside the Super Bowl, the World Series and perhaps the NBA playoffs, it is virtually impossible to view an American sporting event once you leave US soil. Instead, the global sport of choice is soccer (known to the rest of the world as football or futbol). Find a TV in virtually any corner of the globe and most likely it’s tuned into a soccer match. This fact is especially true in Argentina. After consulting a travel guide to Buenos Aires, I learned of the huge importance and virtual legend of the Boca Juniors, a soccer team in the La Boca neighborhood of Buenos Aires. Besides having an outstanding record in South American soccer leagues and tournaments, the Boca Juniors are notorious for having quite possibly the most passionate – some would say “maniacal” – fans in the world. When I asked a few of my soccer aficionado friends back home if they’d heard of Boca Juniors, the response was basically, “Yes, you idiot!” It was as if I had asked them which baseball team plays at Yankee Stadium. 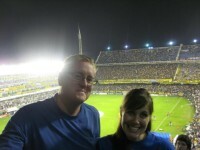 Shanna, a soccer player and a fan of the game, and I1 decided we had to see a game. When we asked a few people how to get tickets, their only advice was to go online and buy tickets from a tourist agency. The agencies would obtain the tickets at an inflated price, pick you up from your hotel/apartment, have a guide with you during the game and whisk you home as soon as the game was over. We immediately rejected this notion, preferring to seek out the authentic experience. This proved quite difficult. Even though the Boca Juniors have a well-organized and in-depth website, there is inexplicably zero information regarding the schedule of the games or how to obtain tickets. We next used our research skills and spent hours (literally, hours) searching for information online and attempting calls to the Boca Juniors office (no one ever answered!). The only information we received was from tourists who had the same problem and eventually gave up and went with the tourist agency. 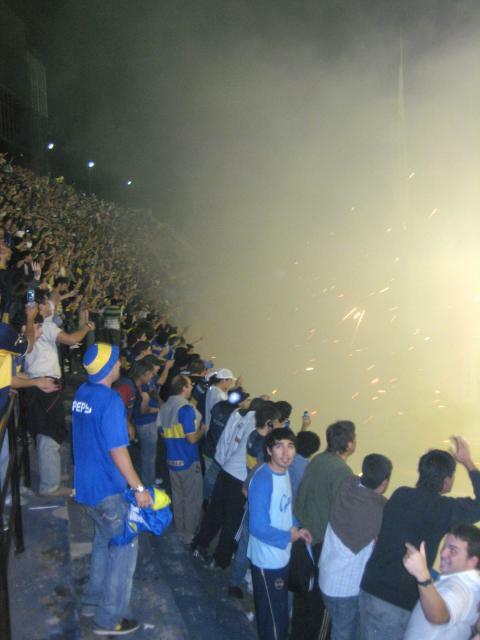 Several comments we found online also noted that it could be dangerous to go to the stadium alone since La Boca is a “working-class” neighborhood that is unsafe at night. If you know me or Shanna at all, you know that these comments sealed it – we were going to get tickets on our own at all costs! 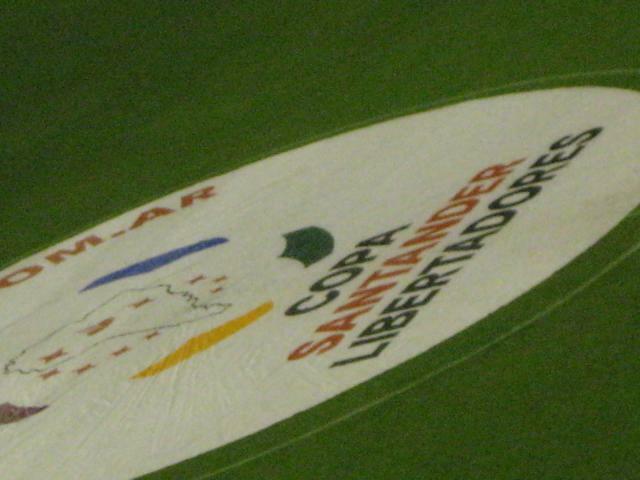 On a Tuesday night, Boca was scheduled to play Maraceibo (a Venezualan team) as part of the qualification round for the Copa Libertadores (Liberators Cup), a tournament that is basically the World Cup for South America. In order to make it to the next round (the round of 16), Boca – the winner of the 2007 Copa Libertadores – had to win AND score five goals. It was a huge game since failing to make it to the next round would be a massive disappointment. Intent on obtaining tickets to the game, we finally resolved to just go to the stadium and see if we could buy them. After a 20-minute taxi ride, we pulled up to the ticket office and spotted a line that almost brought tears to our eyes. We were, however, not deterred; two hours later, tickets for the next night’s game were in hand. 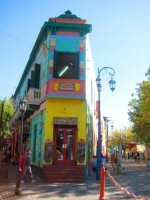 After securing the coveted tickets, we were able to explore the neighborhood of La Boca, which is famous for its colorful buildings. We arrived at La Bombonera (meaning, for reasons we don’t understand, “chocolate box”), the affectionate nickname of Boca’s stadium, at 8 pm, about an hour before the start of the game. La Bombonera is a huge chunk of carved concrete painted blue and yellow, and other than a few vendors of nuts and Argentine versions of hot dogs and hamburgers, it offers nothing to the fan other than a view of the game below. There are no pre-game buffets on the club level, no plush skyboxes for entertaining corporate clients and no giant tv screens where the fans can watch highlights or commercials during game breaks (in fact, we didn’t even see a scoreboard in the stadium; it is assumed that you are keeping up with every second of the game). Boca fans come solely to root for their favorite team. We had no idea what we were getting ourselves into. The 50,000-plus capacity stadium was completely filled, other than a small section reserved for fans of the opponent. Very few opposing fans seem to make it to La Bombonera, with safety a relevant issue. The opponent’s section is surrounded by high chain-linked fences and guarded by dozens of armed police. 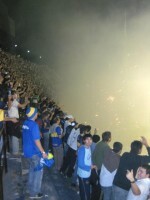 The risk is so severe that the Boca fans are required to remain in the stadium until 15 minutes after the completion of the game, enabling the opposing fans to exit the stadium and quickly flee from the area! As the Boca players entered the field, hysteria ensued. The fans threw uncountable reams of paper into the air, filling the sky and eventually covering a good portion of the field. Seconds later, hundreds of fireworks were fired towards the field from the section of the stadium directly behind one of the goals. The firework of choice for the Boca supporters reminded me of the Roman Candles I used2in the Annual July 4th Firecracker War in my neighborhood, where we attempted direct hits on the other misguided youth who lived nearby (Wait, did I just admit that? Sorry, Mom!). Expecting the volley of fire to last for a brief moment, we watched in amazement as shots were fired for several minutes, filling the stadium and our lungs with smoke. Knowing they needed to score five goals, the players attacked aggressively and scored two goals fairly quickly. The fans were ecstatic and confident. However, as halftime passed with no additional goals, the tone of the cheers went from enthusiastic to nervous. The team needed three more goals to reach their goal. About this time, we learned a vital fact about the game. There was another way for La Boca to advance to the next round – if the game being played simultaneously between a Mexican team and a Chilean team ended in a tie, then La Boca only needed to score three goals, not five. As the game neared the end, the third goal was scored by Boca as we learned that the other game was in a tie and almost over. The crowd went nuts. As time expired in the Boca game with a 3-0 victory, it was confirmed that the other game had ended in a tie and that La Boca would miraculously advance. I can’t describe in words the excitement of the crowds. In my life, I’ve been lucky to attend games at some of the greatest venues in all of sports, from Duke’s Cameron Indoor Stadium to Tennessee’s Neyland Stadium to Fenway Park and Yankee Stadium. Compared to the La Bombonera, however, these prior experiences seem tame. 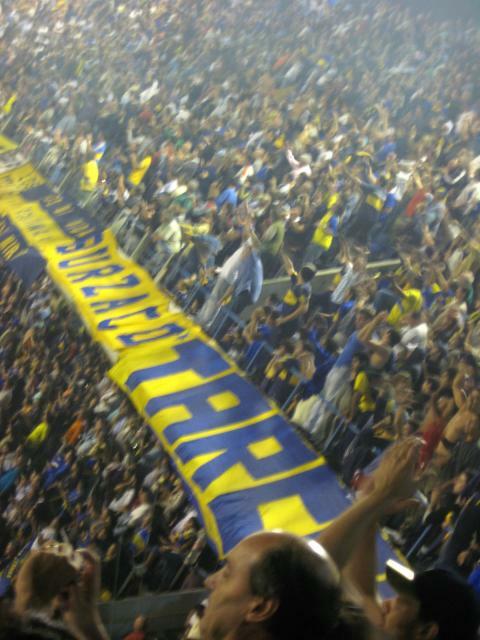 The Boca fans sang, cheered and yelled non-stop the entire game; the sound was deafening. 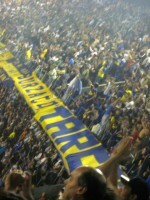 At halftime, no one left their seat since they would have missed a stanza of the La Boca fight song. At the end of the game and after their mandatory 15-minute waiting period (to allow the opposing fans to flee, as discussed above), the fans continued their singing while slowly exiting the stadium. Rarely, if ever, have I seen such passion in such mass quantities. 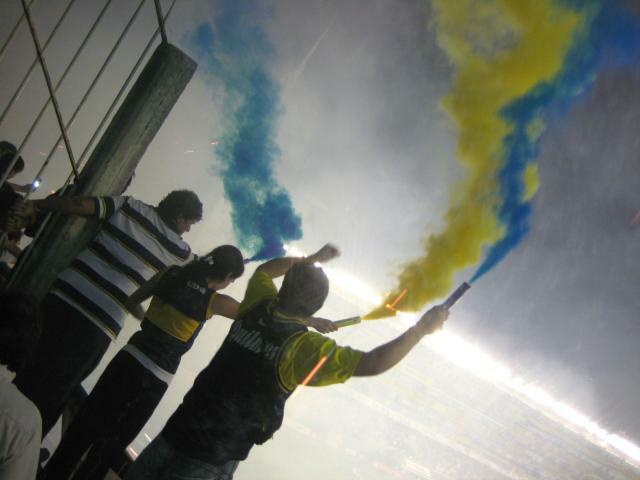 I left that stadium as a Boca fan, and I’m pretty sure I’ll be one forever.